The AC Hotel in Madison, Wisconsin has inadvertently added to the city’s collection of public art. 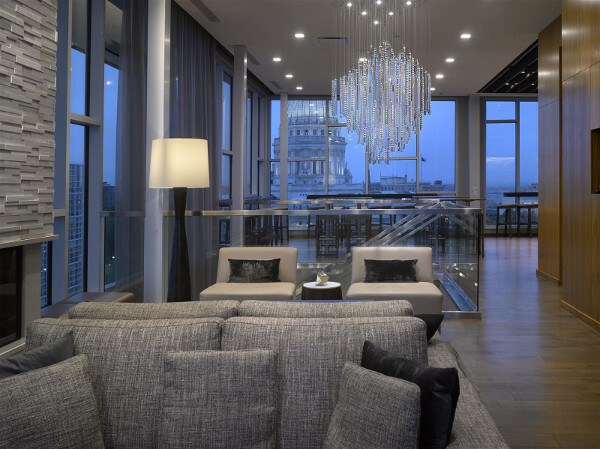 The hotel, which is the flagship of Marriott’s new AC Hotels chain, wanted a stylish talking point in their lounge/bar area. Interior design firm Gary Brink & Associates Architects called on Preciosa Lighting to create a dominate piece, the Ridge Stone Wall. Josef Oulehla was the project manager from Preciosa responsible for this unique display. 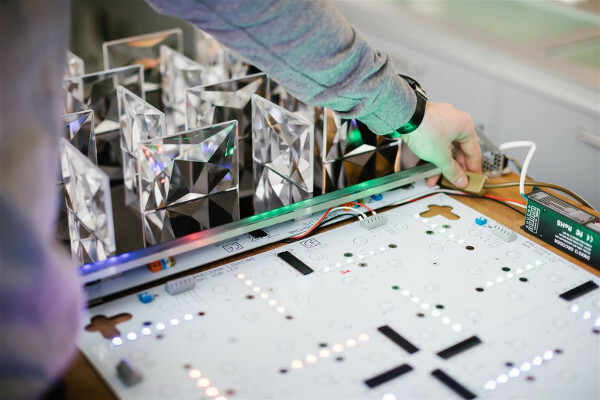 The short time frame of five months to develop, design and install the solution was only the first challenge, he says. Preciosa has an in-house Innovation Lab which project managers call upon to realize the visions of designers from around the world. Milan Kratochvil and Ondrej Dorfl were responsible for developing the needed mechanics. The team built on technology originally created by Preciosa sister company Ornela and the work of Mr. Vacek and Mr. Smid. The stones that make up the wall are crystal components from Ornela. The system allows for light movement in connection with music, and video can be shot via mobile and uploaded to the wall with a special tablet application. Designers can choose the colour scheme of the stones, and that combined with the ease of changing the wall’s scenes means complete customization for every client. It’s this aspect Mr. Oulehla finds to be most beneficial for designers. 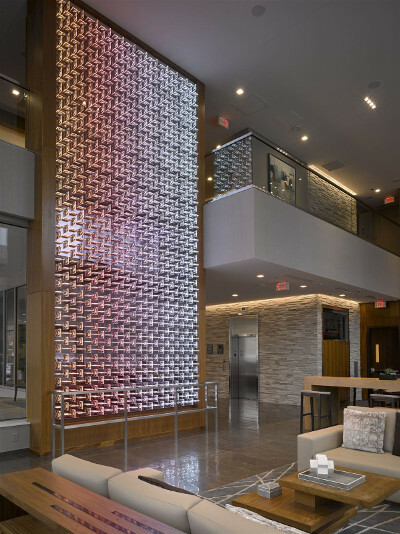 At the AC Hotel Madison, their wall is made up of 1,248 cut crystal components backlit by about 7,000 individual LEDs. The crystals are set at 90 degree angles on an aluminium wall with a black foil cover. This not only provides for maximum glitter but also greatly reduces the weight of the wall. The qualities of snow and ice were the inspiration not only for the decorative wall, but also for the other lighting displays Preciosa designed for the hotel. Called Diamond Cloud, they include lights in the lobby, over the bar and hanging in an upper level stairway. The hotel sits on a corner in Madison’s busy downtown. Because of the full-length glass windows surrounding the lobby, pedestrians can’t help but stop and view the eye-catching piece.